← ‘Cafe 44’ Closes At 44 Leigh Avenue, Will Re-open In Tortugas Space. One of Princeton’s best restaurants, Elements, is moving into the old UPS space on Witherspoon Street opposite Princeton Public Library. The new restaurant complex will unite the existing small plates place, Mistral, with Elements under one roof, with a new bar that is probably going to be pretty fantastic. But as the fitting continues inside, we are admiring this sidewalk detour that has been set up around the construction zone. In many instances, pedestrians are given a runaround when construction is taking place. Sidewalks are fenced off, and a sign appears saying ‘no pedestrians’, or ‘pedestrians use opposite sidewalk’. Occasionally, this is necessary because of safety concerns, but it’s much better practice where possible to allow pedestrians to continue their normal path through a detour like the one shown above. This one is well-designed, because the plastic barriers provide some degree of protection from traffic in the street. It’s a very mundane thing, but all too often, builders skip out on planning for continued sidewalk accessibility. Hopefully future construction in Princeton will follow the best practice shown at the future Elements site. It’s good to see that walkers were considered when planning this work. 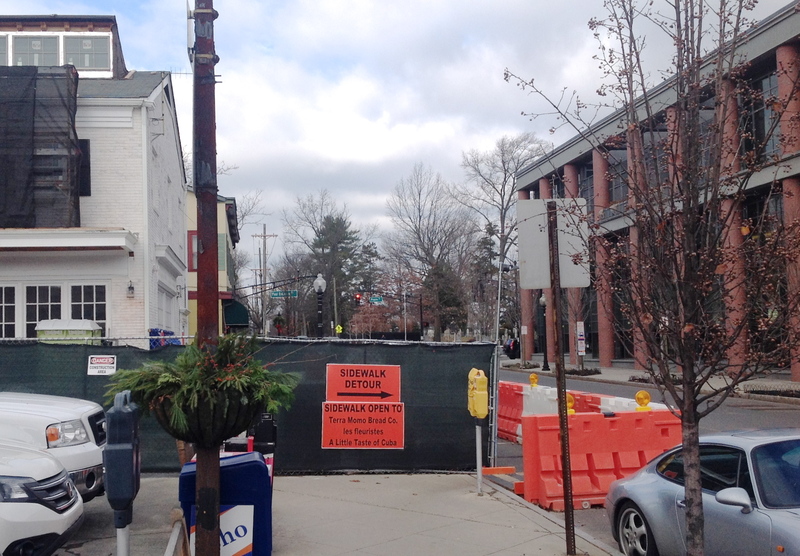 This entry was posted in Downtown Vibrancy, Princeton, Walking and tagged downtown, Princeton, restaurants, Walkability. Bookmark the permalink.